Last week I shared that I was doing some zero waste decluttering, following Colleen’s mini missions over on 365lessthings. This week, she’s not let up and had a series of decluttering plans ready to keep us on our toes; one for each day of the week. You can check them out in all their glory here. Come on, own up – how many things have you planned to return to an online or high street store and forgotten about? Not only does this create potential waste but it wastes money too. Non-working pens are one of my bug bears. There is nothing so irritating as picking up a pen, especially when you’re on the phone and need to record some information, only to find it doesn’t work. In addition old disposable biros end up filling landfill bins as we discovered to our dismay last year. I have now switched to a fountain pen and I rather like using pencils too – both of these offer a zero waste solution. Colleen asked us to discard out of date manuals; this was a great task for me. I love a good rummage through the filing cabinet and I did find a couple of manuals for items I have since freecycled; such as a juicer. Fortunately manuals can be recycled easily in the paper recycling or even sold on eBay. You’ll find that some companies who are doing their bit for the environment have done away with paper manuals and provide online ones instead. Colleen wrote “If you have daughters with hair accessories now is a good time to declutter and re-organise these items.” I do indeed have a daughter with hair accessories but she wasn’t willing to part with any of her pretty adornments. Colleen wanted us to find something in our display cabinets and release it to a charity shop or thrift store. I’m really not one for collections of pretty, yet useless objects. I did consider going back through a crate of stuff in the garage that belongs to my Grandmother, but I’m still finding a lot of resistance to that one – my sentimentality keeps winning. We were asked to clean off the front of our fridges. 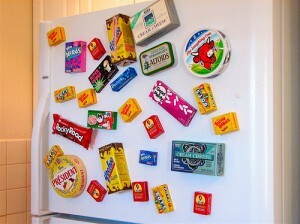 I got off lightly with this one because there is nothing I hate more than a fridge covered in useless clutter like magnets. I have a poem a friend gave to me, a magnetic business card with rather a lovely picture on it and there was a magnet on there which Little Miss Green bought me. I never use it but she was rather proud of it. After a short discussion she gave me her blessing to rid our home of it so into the charity shop box it went. As you’ll be aware, the garage is Mr Green’s domain. It contains his ‘one day’ stash – lots of items which look like rubbish to me, but which he claims is a resource. So far he has made a treehouse, a conservatory and several pieces of furniture from his stash of erm, rubbish, so I am in no position to dump the lot, which is what I would like to do. Colleen challenged me to send Mr G out there to get rid of two items but he was having none of it which then bought up whether I really should go in there and sort through the crate of my Grandmother’s stuff. How did you get on? I know lots of you are decluttering this month; have you created any landfill rubbish or did you manage it the zero waste way? If you have already covered this topic , my apologies. After a family vacation, we had lots of photographs developed that we probably should not have printed. Although I am writing from the US, would you know if photographs can be put with recyclable materials ? I realize that the UK may have different practices but I wondered if you had any information in general. once again you have made me proud. Although I am still sure your husband could find 2 things in that garage. But it does sound like he is getting good use out of it on occasion so I will let him off this time. I hope you are having fun with this week’s mini missions. I am looking forward the next week’s report. @Pippa: I’d love to be in touch with a pen collector. We got to quite a few conferences and it doesn’t seem to matter how many times I say “No Pens” to DH, he always comes away with pockets loaded. There are some I hang onto and I have also taken loads to school as the teachers are always grateful of a new pen, but I really do the like the idea of someone wanting ‘dead’ pens! The best idea I had was to make a reuse box in my house, everything that works but I don’t need goes in there. Sorting the stuff as I find it makes it easier when I have a moment to do something with it later, otherwise you’re trying to remember where all those things you meant to do something with last week are. I also like that I get the space back almost instantly in the room where I found the item. I sell some of it on eBay, give some of it to charity shops and sometimes give the items as presents. Not too much goes to landfill, mostly it’s broken items.